The All in One Pregnancy Complex offers advanced nutritional support and an essential range of micronutrients needed during both pre and post pregnancy. Formulated with PregMax100™; a special blend of the Co-Q10 enzyme and essential minerals, it also contains a comprehensive range of vitamins, minerals and nutrients that form the basis for good health. All nutrients are at levels considered safe during pregnancy, yet high enough to impact on health. They are also in the most bioavailable (easy absorbed and utilised) forms possible to ensure maximum effects. The formulation also contains probiotics for easier digestion and assimilation of the nutrients. Most nutrients require the presence of other nutrients to work properly and should not be taken individually. It is very important that pregnant women are advised only to take products recommended for use during pregnancy or that they speak to a qualified healthcare professional. Calcium (Citrate), Magnesium (Citrate), Vegetable Capsule (Hydroxypropyl Methyl Cellulose), Potassium (Citrate), PregMax100™ (Blend of Co Enzyme Q10, Choline (Bitartrate), Sodium Borate), Calcium Ascorbate, Lactobacillus Acidophilus 10bn, Lactobacilus Bifidus 10bn, Choline (Bitartrate), Iron (Gluconate), Zinc (Gluconate), Inositol, Vitamin B3 (Nicotinamide), Citrus Bioflavonoids, N-Acetyl L-Cysteine, Co Enzyme Q10, Vitamin E (Natural) Tocopheryl Succinate, Manganese (Gluconate), Vitamin B5 (Calcium Pantothenate), Para Amino Benzoic Acid (PABA), Beta Carotene 10% from Dunaiella Salina, Vitamin D2 (Ergocalciferol), Copper (Gluconate), L-Arginine, L-Histidine, L-Isoleucine, L-Leucine, L-Lysine, L-Methionine, L-Threonine, L-Valine, Selenium (Methionine), Vitamin B6 (Pyridoxine HCL), Vitamin B1 (Thiamine HCL), Vitamin B2 (Riboflavin), Sodium Borate, Folacin (Folic Acid), Vitamin K 5% Prep., Chromium Picolinate, Biotin, Potassium Iodide, Molybdenum (Ammonium Molybdate), Vitamin B12 (Cyanocobalamin). Keep refrigerated and out of reach of children. It is very important that pregnant women are advised only to take products recommended for use during pregnancy or that they speak to a qualified healthcare professional. 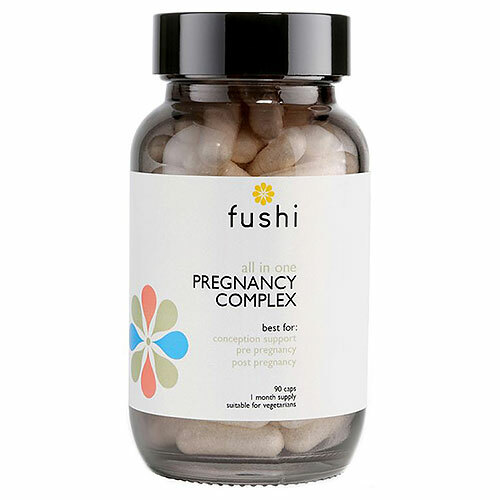 Below are reviews of Fushi All in One Pregnancy Complex - 90 Capsules by bodykind customers. If you have tried this product we'd love to hear what you think so please leave a review.